The Senate backed key players of President Donald Trump’s national security team on Wednesday, confirming his pick for intelligence director and clearing the way for an active-duty Army general to serve as his national security adviser. Senators voted 85-12 to approve the nomination of former Indiana Sen. Dan Coats as director of national intelligence, making him the fifth person to hold the post created after the Sept. 11 terror attacks. Coats replaces James Clapper, who retired at the end of the Obama administration. As the Trump administration’s top intelligence official, Coats will oversee 16 other intelligence agencies that have been harshly criticized at times by Trump president for past failures and their assessment that the Kremlin interfered in the election to help him win. Coats, 73, has swung back and forth between government service and lobbying, the type of Washington career that Trump has mocked. Since the early 1980s, Coats either has served in government or earned money as a lobbyist and board director. His most recently available Senate financial disclosure, from 2014, shows he had a net worth of more than $12 million. He faced a friendly confirmation hearing last month in front of his former Senate colleagues. He was pressed on whether he would stand up to political pressure from the Trump White House and assured lawmakers he would provide accurate and timely intelligence. Sen. John McCain of Arizona, the Republican chairman of the Senate Armed Services Committee, said Coats will be an effective director and also would restore credibility to the U.S. intelligence community. Minutes later they voted 86-10 to re-appoint H.R. McMaster as a three-star general “to a position of importance and responsibility.” National security advisers aren’t subject to Senate confirmation. But McMaster elected to remain in uniform rather than retire from military service, and generals need the chamber’s approval when they’re promoted or change assignments. Trump selected McMaster to lead the National Security Council as controversy swirled over communications that members of Trump’s campaign team had with Russian officials. McMaster’s predecessor, Michael Flynn, was asked to resign after misleading senior administration officials, including Vice President Mike Pence, about the nature of his contacts during the transition period with Russia’s ambassador to the United States. Left: Former U.S. 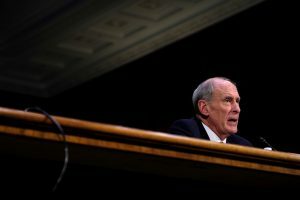 Senator Dan Coats (R-IN) testifies in February before the Senate Select Committee on Intelligence on his nomination to be Director of National Intelligence in Washington, D.C. Coats was confirmed by the Senate on Mar. 15. Photo by REUTERS/James Lawler Duggan.